The Key: Young Critics Mentorship Program brings students to various productions around Chicago, teaching them about arts criticism as they try their hand at writing reviews. The opinions of the students are their own; we workshop the pieces in seminar every other week, and then they edit their reviews before publication. This week we are sharing their first submissions on Steppenwolf Theatre Company’s The Crucible. Workshopped and Edited by co-facilitators Regina Victor and Oliver Sava. Jonathan Berry’s adaptation of The Crucible turns the story on its head. The modernized delivery of the language and a minimal cast provides a new look at what really went down in Salem. In addition to the small cast of 13, the staging is quite minimal as well. I found this to be quite effective because it gave the stage a look of simple beauty and forced the audience to focus solely on the context at hand. Although we are always changing and growing as a society, the lack of embellishment in the staging allows you to connect the play’s plight to any time period. The small cast called for a substantial amount of double-casting, but this was intentional and it worked. It forces both the actors and the audience to stay connected and attach a new role to the same face. Actor Tituba doubled as Judge Hathorne, the power complex between the two was vast and the amount of actor work put into to make these roles equally believable yet entirely separate had to have been immense. The same is to be true for actor Betty who doubled as Elizabeth Proctor. We see significantly more of her work as Elizabeth but the moments we have with Betty, it might as well be an entirely different actor altogether. That being said, the differentiation between characters was clear, but Elizabeth’s chemistry with John was not. Now I know how the story went down between the two, but believe it or not, some folks have still not read The Crucible, meaning for that scene, until she’s mentioned, it’s not explicit that their awkward nature is due to John’s lechery with Abigail Williams. About Abigail… She’s brown! In fact at least half the cast are people of color! I think this was a beautiful choice, their browness doesn’t distract or call attention to itself, yet it still changes the play in a very big way. It feels more authentic to have these different ethnicities in the same room. Though historically this is not how it went down, it doesn’t hurt the plot or the message so I am all for it. Abigail deals with a power struggle for many reasons, most of them come back to her being female, throwing in her blackness only heightens that struggle, and then, before you know it, this young black adult girl is ruling the town. The only thing I’ll say about this is I found Abigail’s character to be too one-dimensional, she’s conniving, she’s manipulative, and she’s scary, but she’s also a child, and I didn’t see that side of her. Another thing I found to be beautifully done was the language interpretation. Reading The Crucible as a highschooler, the language creates distance between the story and the reader. Hearing real time words and justifications during the watching of the show came as both a surprise and a relief to me because it was the first time I’d ever seen The Crucible and understood everything the first time it was said. This also made for a more emotional story, hearing everything clearly helped me to focus on the story and its’ emotional intent better than having to decipher the language and then struggling to keep up. That being said, I’ve studied the show for three years now and no amount of analytical discussion or handouts could do it justice, you really do just have to see it. I had the pleasure of seeing the show twice, with two entirely different audiences, once with adults and once with high schoolers. The second time around, I caught onto things even I had missed, despite how much time I’ve spent with the play. I found there was more room for laughter when I saw the show with high schoolers, I actually don’t know why this was but I’m not complainin’! All in all, would I say spend your money on this? You’re not a fool if you don’t, but if you’ve got the bread, go ahead honey! Most everybody knows The Crucible. Maybe not well, and maybe not by choice, but you would be hard-pressed to find someone without an inkling of it’s existence. I walked into The Crucible at Steppenwolf with very high expectations. Having only ever read the play before and being totally enamored by the text, I could not wait to see what they would do with it. I hate to admit it, but I was disappointed. I in no way mean to discredit Arthur Miller’s genius when I say that when not done correctly, it becomes a wee bit difficult to sit through nearly 3 hours of a continuous onslaught of accusation and denial. It is simply not a dependable classic. These scenes are long, and it is shockingly easy for them to feel as though they are dragging on forever. Steppenwolf’s The Crucible was one of those productions where the decision was made to keep the cast on stage the entire time. I think that this can be a fascinating addition to any show. The chairs lining either sides of the stage with the remaining cast serving as a kind of jury to the proceeding of the drama was certainly not missed, however with many of the scenes in the show requiring the majority of the cast on stage for long periods of time already (especially with the decision made to double cast), many a time was encountered where the chairs were empty aside from the only two or three actors not in the scene, and the effect desired was altogether lost. I didn’t necessarily have a problem with the staging, but I did find it a tad bland. It never shocked me or made me think differently about what I was experiencing. The soundscape I loved, and I found myself wishing it was incorporated more often and more heavily. I feel like transitions in The Crucible can be hard to achieve success in, but the drum beats were somehow intense and subtle at the same time, providing of means of easing us into the next part of the story without losing what we had just seen. While I am all behind the incorporation of dance elements, if the actors seem uncomfortable with the way their bodies are moving, then so am I. Besides Kristina Valada-Viars, the physicality of the actors was fair, but nothing remarkable. Her frantic depiction of the ailing Betty sparked a necessary uncomfortability that set the tone for the rest of the production. When it comes to the actors, I found some of them to be slightly overbearing. I was taken out of Salem and found myself watching and hearing people doing their best to let me know how lofty their dialogue was, how weighty the message they were attempting to portray. Many left me bored and disinterested, too much like I was on the receiving end of a preachers ramblings. Naima Hebrail Kidjo’s Abigail in particular, left me unsatisfied. In the first act, she piqued my interest. Her harsh stoicism captured me and left me thirsty for how her character would progress. Unfortunately, she never did. Abby is malicious and spiteful, we get that. If you just play her as that and nothing else though, I’m bored. While strong, her performance was incredibly one note; I never got to see Abby as the multidimensional young girl struggling to establish herself in a community that has no need for her. I never sensed any vulnerability or sincerity, I never once understood her to be the child that she is and so I no longer cared about her. Travis Knight as John Proctor did a wonderful job. He did not immediately come off as the hero, an important factor in a show so often described as displaying a too starkly black and white version of good and evil. I found myself disliking Proctor’s character at the start. He was too aggressive, to hard headed and blunt. This was a positive thing because it allowed me to see the obvious good guy of the story as more than simply an honorable man. The problem I had was he was in another show. Knight’s Proctor was modern and exotic, a foreigner to 1872 Massachusetts. While the rest of the cast was trying, sometimes even a bit too hard, to prove to the audience that they were living in a world before electricity, he was not (even in costume, donning a snazzy pair of cargo pants.) This again, does not mean his performance was not incredibly striking. Knight did a wonderful job of expressing unspeakable frustration and powerlessness, but his performance simply did not match up with the rest of his ensemble and he ended up seeming out of place. Erik Hellman as Hale did nothing for me at first. He was simply another individual being wrapped up in the hysteria, nothing special. But as his awareness of his actions grew, Hellman provided an honest glimpse into what true remorse and repentance looked like in a play riddled with obligatory false confessions. His recognition of himself as a conspirator to the madness only came about when he was powerless to do anything to stop it the horrific and concrete nature of these actions. His guilt was profound, and much needed. Taylor Blimm as Mary Warren was simply exquisite. Playing a character I had never before paid much thought to, she stole the show. Her apt expression of fear and bewilderment, her absolute seduction by the spiraling insanity; it was the perfect encapsulation of the necessary indoctrination that allowed the witch trials to progress as far as they did. In today’s rocky social and political climate, it couldn’t have been a better time to resurface this particular Miller gem, especially with the intent of generating an audience full of young people. Now I must admit, I have a complicated history with Steppenwolf’s Young Adult Theatre. My high school years were spent frequenting their productions with my school, where I found the whole experience incredibly patronizing. It was exhausting, entering an artistic space so painfully and meticulously constructed for hip teenagers “just like me!” That was not the case here. Nothing about the play seemed to be worked in a certain way to make it more appealing to a newer generation, and I was indubitably grateful. The decision to produce The Crucible instead of The Crucible where you can totally relate right, do you get it? was the correct one. A gaggle of soon to be adults have gotten to see this show. They (we) are learning what it means to think independently. They (we) are discovering how to form definitive opinions separate from the influence of the surrounding world. We are learning what our devil is, and how to decide for ourselves who we see it with. Redoing a classic is harder than most people think. You’re fighting expectations of tons of people who’ve seen and read it (or at least read the summary). Everyone knows what the play should look like, what it feels like, and they’re going to want something different. So here we are with the Steppenwolf, a world-class theatre attempting The Crucible. If you’re looking for a revolutionary new production that redefines the work of Arthur Miller in a way that has yet to be accomplished…I can’t say it lives up to that. It isn’t a “bad” play. On the contrary, The Crucible is an amazing script. Arthur Miller is a damn good writer. It’s a masterpiece in four acts, a story more universal than we’d like to admit. From the Salem Witch Trials to McCarthyism, to “…and some, I assume are good people.”, this is a blade that never loses its sharpness. John Proctor sacrificing everything to stand up against xenophobia and keep his good name is some dope stuff. You’ll also find one of the best stage performances all year. Simply put, Michael Patrick Thornton as Deputy Danforth is astonishing. Natural, authoritarian, loyal to a higher power only he claims to understand. He exudes power and fear in a way that galvanizes the rest of the cast and crew to pick up their game. It’s one of the best villainous performances I’ve seen all year, better even than Justin Theroux’s show-stopping turn as Lord Garmadon in The Lego Ninjago Movie. If I was to choose this version of any reason, it would be for this dude. 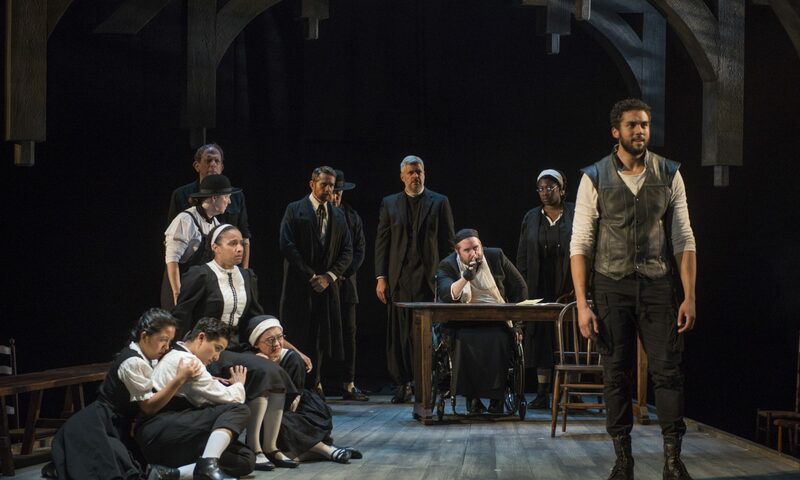 While there is notable effort to make this production of The Crucible new and exciting, it just tends to be lackluster at times. The production’s attempts to “punch it up” only dulls the script’s blade. Actors seem to move constantly across the stage. It’s very possible director Jonathan Berry is trying to keep things dynamic for the teens in the audience. More often than not it comes off like all the actors are in a fantasy world where object permanence doesn’t exist and courthouses let people strut their stuff when giving testimony. The acting is overall satisfactory, though occasionally it seemed they were trying too hard to give Arthur Miller’s language meaning and as a result would enunciate every line like it is the most important thing ever spoken, the scene’s emotion be damned. Peter Moore plays Reverend Parris like he’s at a pulpit reading the great works to you. Fine for a church, but not so compelling on stage. Travis Knight is pretty great as John Proctor. However, he does sometimes slip into sounding more like a table read than a rehearsed performance. I can’t say this is something I’d rush out to go and see. I can’t say to someone who’s read the play that seeing this would make it “even better”. But if you’ve never seen The Crucible before, the script is still there and wonderful. If you want to see something topical in these dark and trying times, this will fit the bill. And if you feel compelled to see Mike Thornton’s take on a great villain before it disappears into the mist, I guess I’d dance on over. Just don’t let any priests catch you on the way there. The Crucible is an interesting story that takes place around the 1700’s and centers around the acceptance and rejection of citizen based off of religion and practices. It talks about a young girl named Abigail who seems sweet at first but actually drags her friends into a world of deceit. They roam into the forest getting into witchcraft practices with Tituba, which wreaks havoc in Salem after one friend involved with the practice came back very ill. As they try to unravel who is responsible for putting witchcraft in the young innocent children’s lives, you learn just how far Abigail will go to make sure her name stays clear. I liked a lot of the stage directions and interpretations by director Jonathan Berry, including having the actors sit on the side watching the piece, representing how rumors spread and word gets around the small village. I also liked how at the end the chairs were hung to represent how many were victim to the false accusations. This production touched upon how religion was instilled in African Americans in that time period as a necessity for survival. If you believed in anything other than Christianity you could die. I realized as I watching the play I had read the book in high school, and I think this production captured the story really well. It’s a real nail biting story that keeps you on the edge of your seat. The cast gives great performances and I enjoyed all of them, but Abigail Williams (Naima Hebral Kidjo), Mercy Lewis (Avi Roque), and Deputy Danforth (Michael Patrick Thornton) stood out to me the most. I found myself angered yet amused at the same time (which is how I felt when reading the script). Abigail Williams’ character was played by Naïma Hebrail Kidjo who must have been studying for months to capture a character so evil and deceitful It made me dislike her so much. The judges’ ignorant and arrogant behavior made you question their motives and their entire educational background! In the courtroom scenes I couldn’t help but have my eyes glued to the stage as they made up ludicrous scenarios while trying their victims. Something worth noting are the roof pieces hanging above the stage, which I interpreted as communicating that the village is the church and the church is the village. Everything that happens in Salem is always heard or expressed in the church, and in the eyes of the Lord, privacy doesn’t exist.